Over winter break we noticed a lot more bicycles on the streets than there were at the same time last year. It’s now rare that I’m the only rider on the streets on my route, whatever route that might happen to be. Last week, riding from our son’s school to downtown, I was surrounded by so many other riders that in combination with being tailed by a bus, which blocked cars from potentially rear-ending any of us, I relaxed and started looking at other people’s bikes instead of focusing on traffic. As is increasingly common, there was an assisted bike in the group, this one ridden by an older gentleman dressed up for work in the Financial District. He looked like the kind of person who wouldn’t be riding an unassisted bike. On most work days I look like that kind of person myself. It is no accident that I pretty much stopped taking transit entirely when an assisted bike (the mamachari) entered our lives. We live on the top of one big hill and I work on top of another, and before that particular craigslist score there was always calculation involved in riding to work: “Am I going to have to look presentable today?” (I don’t have the patience or free time to carry a spare set of dress clothes and shower at the office, assuming that my office even had a shower, which it does not.) With an assisted bike that problem disappears. I can choose to work harder on the way home at the risk of sweating, and I often do. But I can also choose to use enough assist that I arrive at work with no more evidence of having ridden a bike than rosy cheeks and the complete absence of commuter rage. “Wait, what? You came here on a bike?” is the kind of thing I hear a lot these days. It’s coming up on a year of electric assist for us, and there’s no question it’s been life-changing. 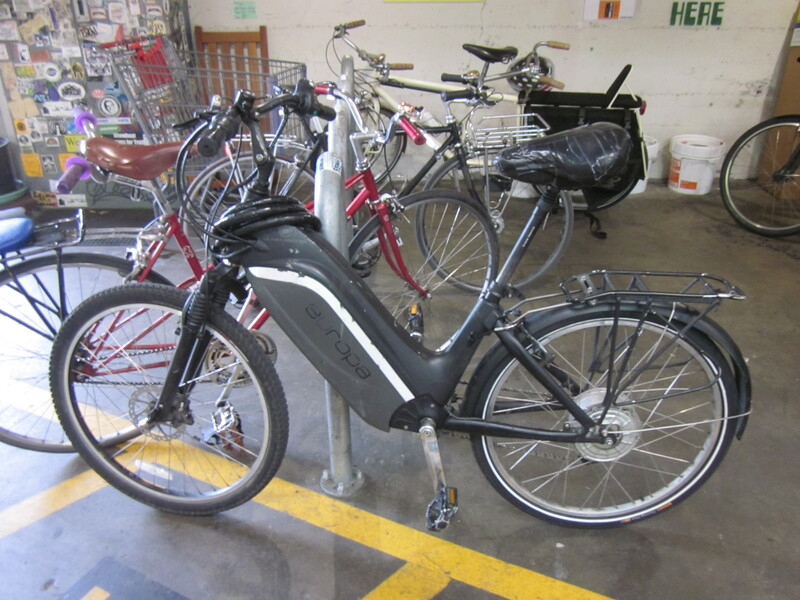 Example: we sold our only car (30 Days of Biking is no challenge whatsoever this year). To my surprise, because we’re about as fashionable as any other harried parents (which is to say: not at all) we appear to have been out in front on this issue. 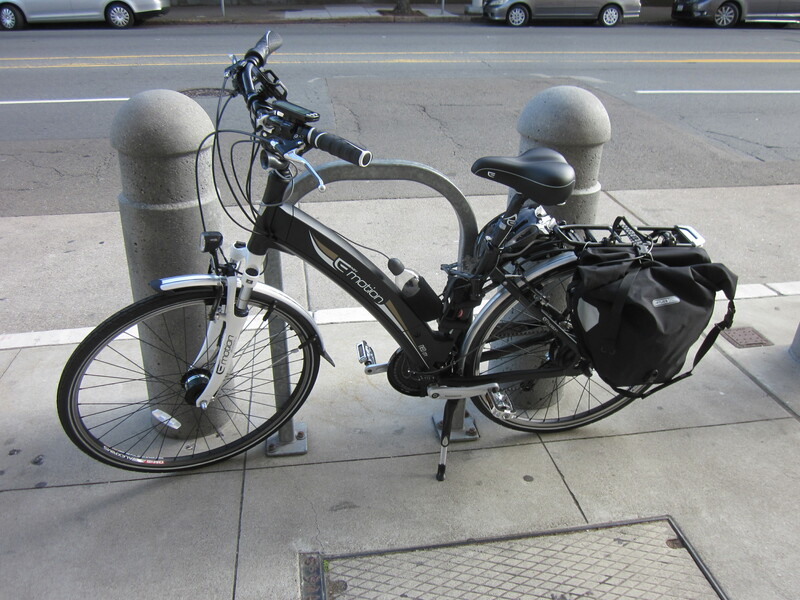 From what I’ve seen so far, 2013 is the year of the electric assist in San Francisco. Assisted bikes are everywhere; I spot them while riding around, while walking in our neighborhood, and there’s always at least one locked up nearby every time I stop to park my bike. Cargo bike riders who don’t have one typically say they want one, even if the need to carry a bike up a flight of stairs or the extra cost makes adding an assist unfeasible. I don’t ride much where it’s flat, but people who do seem to ride more with assisted bikes as well. The assist is like the cover on the Bullitt; in winter we could dress up our kids to ride without it, but it’s easier to get them out the door by skipping the cold weather gear and letting them cozy up under the cover. I could get myself out the door on an unassisted bike, and I have, but it’s a lot easier knowing that I can get a little help when the hills get steep or the wind gets fierce or when I’m tired at the end of the day. It’s also easier to take a bike knowing that I’m not going to walk into a meeting at work dripping with sweat. Unless I’m crossing the bay (and sometimes even then), it’s always easier to ride a bike now. And so that’s what we do. Things seem to be changing around you. I heard that some people disliked to take shower when they biked to work in the US. 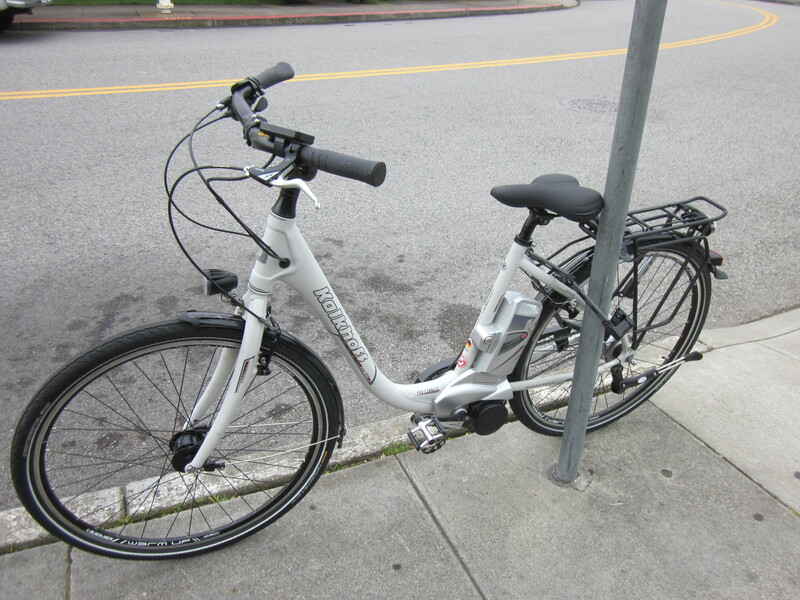 I don’t imagine many your neighbors ride their electrically assisted bikes, but it seems true. 😉 Someday, someone will ride Anjelino Assista which I will offer !